Their rusted hinges let out a pair of screams, for all those who might have slept through the breaking of the lock. A wash of sudden heat assaulted them, heavy with the odors of ash, brimstone, and burnt meat. It was black beyond the doors, a sullen stygian darkness that seemed alive and threatening, hungry. Quentyn could sense that there was something in that darkness, coiled and waiting. When Prince Quentyn Martell finally managed to enter the chambers where Queen Daenerys locked her two children remaining in Meereen, nor him, nor his dornish companions or of the sellsword commando, were prepared to front the two dragons emerging from the heat and darkness below the Great Pyramid. He first met Rhaegal, the green dragon, that was in the pit just in front of him; only after a few moments battling his fears engaging with the beast he was remembered of the second dragon, Viserion, the white one, to find him hanging over him from the vaulted ceiling. 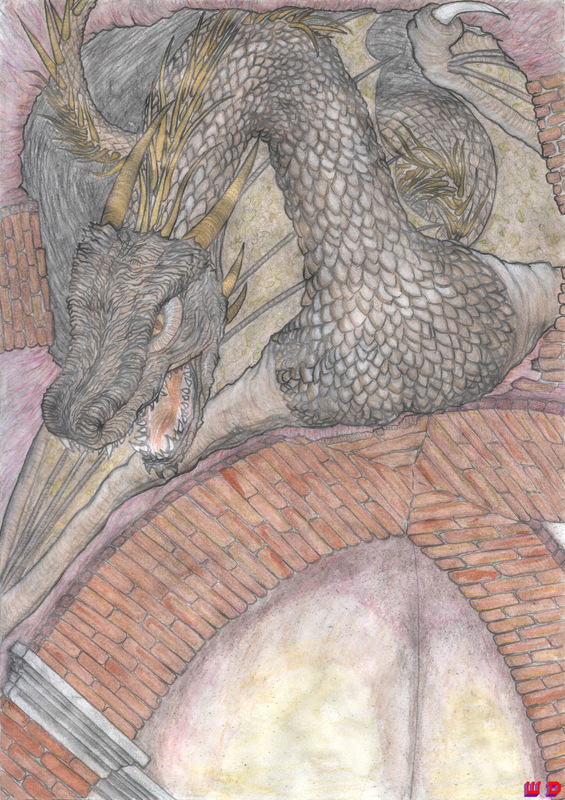 For a moment he saw only the blackened arches of the bricks above, scorched by dragonflame. A trickle of ash caught his eye, betraying movement. He’s made himself a cave, the prince realized. A burrow in the brick. The foundations of the Great Pyramid of Meereen were massive and thick to support the weight of the huge structure overhead; even the interior walls were three times thicker than any castle’s curtain walls. But Viserion had dug himself a hole in them with flame and claw, a hole big enough to sleep in. And we’ve just woken him. He could see what looked like some huge white serpent uncoiling inside the wall, up where it curved to become the ceiling. More ash went drifting downward, and a bit of crumbling brick fell away. The serpent resolved itself into a neck and tail, and then the dragon’s long horned head appeared, his eyes glowing in the dark like golden coals. Viserion’s lair under the Great Pyramid of Meereen by Winter Design is licensed under a Creative Commons Attribution-NonCommercial-NoDerivatives 4.0 International License.